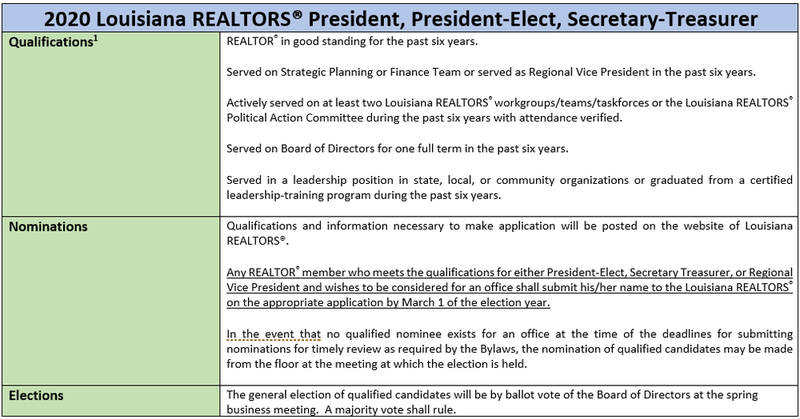 Annually during the Spring Into Action Conference, Louisiana REALTORS® holds the election for the positions of President-elect, Secretary/Treasurer, and (4) Regional Vice Presidents. Members interested in submitting an application to be a candidate for any of the positions will need to reference the following documents provided. Deadline to submit an application is March 1, 2019. Presidents shall meet the LR candidate qualifications as of this date. Candidates shall submit applications by this date to be considered for elected office. LR staff to notify any candidates that do not meet the criteria for said office. Candidate applications shall be posted to the LR website. Committee and completed by this date. Candidate elections held during the LR BOD meeting. 1. Candidate’s headshot and application shall be posted on www.larealtors.org. Any additional campaign materials not a part of the application will not be posted on the Louisiana REALTORS® website. 2.  The Board of Directors contact list is available upon request. Candidates may use the list to reach out to the board members prior to his or her election via email, phone, or mail. The complete LR membership list will not be available. a. Officer and director candidates may campaign in person at LR conferences by distributing campaign items to each board member before the meeting. LR staff shall not distribute materials on a candidate’s behalf. b. Secretary-Treasurer candidates shall be allotted one minute to speak at the spring conference Town Hall. c. RVP candidates shall be allotted time to speak at his or her respective regional caucus during the spring conference. d. Director candidates shall stand to be recognized at the fall conference Town Hall. e. LR staff shall neither plan nor attend any campaign event. 4.  Refer to the LR Constitution and Bylaws for candidate qualifications. 5. All voting is conducted in accordance with Robert’s Rules of Order.